KidKraft 27-Piece Cookware Playset Just $7.88! Down From $25! Shipped! You are here: Home / Great Deals / Amazon Deals / KidKraft 27-Piece Cookware Playset Just $7.88! Down From $25! Shipped! Hurry over to Amazon where you can score this KidKraft 27-Piece Cookware Playset for just $7.88 down from $24.99 PLUS FREE shipping! Your little chef can now prepare and serve delicious imaginary culinary delights with KidKraft’s 27 Piece Kitchen Play Set. 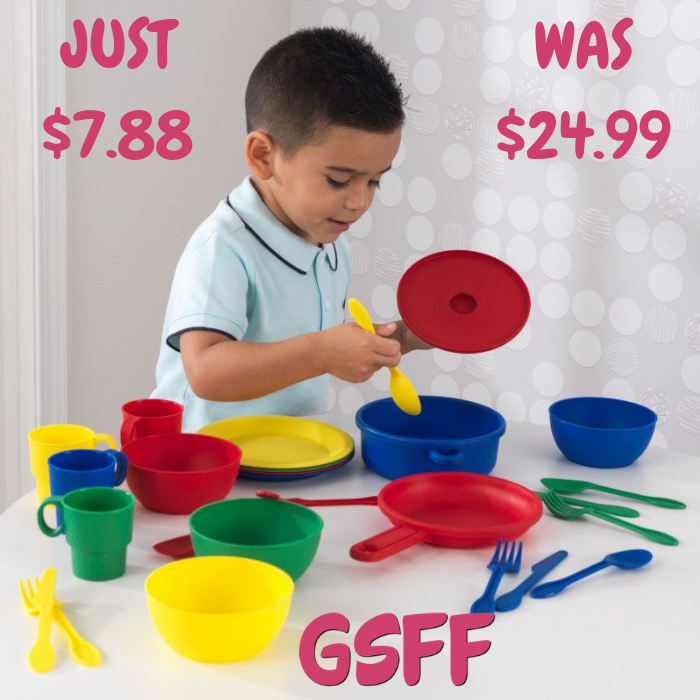 Molded in durable plastic and set in primary colors of red, yellow, blue and green this extensive kitchen set includes: 1 frying pan, 1 pot with lid, 4 cups, 4 bowls, 4 plates and 4 sets of silverware. Set is not dishwasher safe or food safe. Items should be spot cleaned with warm water and dish soap. To use with friends, family, or stuffed animals. This 27-Piece Cookware Set has everything little cooks needs. This complete set is bright and cheery. Made from durable plastic that is easy-to-clean.